By Anthony Crupi . Published on November 05, 2015. 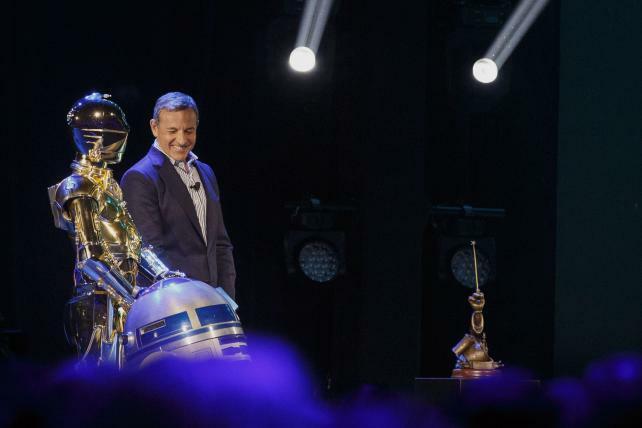 Bob Iger, CEO of The Walt Disney Co., next to 'Star Wars' characters C-3PO and R2-D2 at the D23 Expo in August. While a good deal of the Walt Disney Co.'s quarterly earnings call on Thursday concerned itself with the upcoming "Star Wars" theatrical, analysts were quick to address the 800-lb Wookiee in the room. When asked to reassess comments he made about subscriber losses at ESPN -- remarks that led to an August media-stock meltdown -- Disney chairman and CEO Bob Iger appeared to shrug off the question. "There is nothing that I'd either retract or in any way change," Mr. Iger said. "To just reiterate what we did [on the last earnings call], we updated guidance that we had given in 2014 about ESPN sub fees, and that guidance holds today. We also decided to be candid, I think maybe refreshingly so, about what the industry was experiencing in terms of sub losses during the period." Mr. Iger went on to suggest that he did not see any reason why his earlier remarks should have been received as they were. "The fact remains that we're in an environment today that's definitely changing ... and there is a lot more competition for people's time," he said. "Interestingly enough, we have an opportunity to distribute our content in many different ways than we ever have before ... so there's not only a silver lining, there's a glass-half-full perspective on this." The Mouse House boss went on to say that demand for live sports remains "incredibly strong," adding that of the year's 50 top cable telecasts, more than half (26) were carried by ESPN. "Demand for [live sports] probably has never been greater, and that's, I guess, a roundabout way of saying that we don't have anything to really add to the comments that we made," he said. "We feel bullish about ESPN and ESPN business." Ad revenue at ESPN was up 5% in the quarter, reflecting the sale of more units than in the year-ago quarter. Recent upbeat commentary from the likes of Comcast and AT&T/DirecTV would seem to support the notion that pay-TV subscriber declines are decelerating, but Lowell Singer, senior VP-investor relations, chose not to make any further projections about carriage churn. "We're not going to make any predictions about is going to happen with the subs," Mr. Singer said. "Generally, what we're seeing is consistent with what we talked about last quarter. Having said that, this market is going to continue to evolve. There's room for optimizing the bundle, and there are opportunities to increase the price-value relationship as well as the user experience." That Mr. Iger's acknowledgement of ESPN subscriber losses should have set the stage for the loss of $60 billion in market capitalization in just two days this summer speaks volumes about the media sector's inherent volatility and a sort of free-floating angst about the impact cord cutting is having on the traditional TV business. But a closer look at ESPN's financials suggests that the sell-off was largely irrational; with a $6.65 sub fee, far higher than any other channel, and some 92.9 million subs, ESPN this year will generate a staggering $7.41 billion in affiliate fees. As for the approximately 3.2 million subs that Nielsen says have parted ways with ESPN in the last year, they represent $255 million in lost revenue. That's certainly not chickenfeed, but it's also a pittance when compared to the billions the network is paid by cable, satellite and other pay-TV operators. On a far more upbeat note, Disney is on the verge of releasing what will almost certainly be the biggest blockbuster of all time, when "Star Wars: The Force Awakens" lands in theaters on Dec. 18. "We're very excited," Mr. Iger said. "And if the reaction to the trailers and ticket presales are any indication, we're not the only ones." Mr. Iger reminded investors that the first "Star Wars" movie since the forgettable prequel series is only the beginning of a new generation of Wookies, droids and Jedi knights. "J.J. Abrams' cast and crew have delivered a truly epic adventure, but what's even more exciting to us is that ... we'll have three new Star Wars films in theaters between now and the end of 2017," he said.